We in the media have wondered how we might know if The Cosmopolitan is doing well. It's a private company and they're not obligated to tell us, and I'm quite confident John Unwin's never going to bemoan conditions to wretches like me or Howard Stutz. Happily, I recently discovered my favorite gaming industry analyst, Robert LaFleur of Hudson Securities, is back in action tracking room rates and providing reports to journalists. Rates are pretty much the only external data available, but it's painstaking to keep up with it because of the fluctuations. He does it so we don't have to, and his latest weekly report, out today, paints a fascinating early picture of Cosmo and what it's done to Aria and even Bellagio in its Shiny New Thing phase. 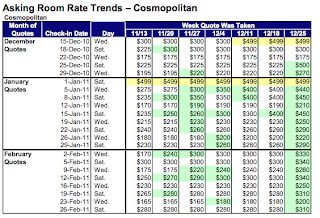 That graphic above (click on it to enlarge) shows that Cosmo has been raising its room rates dramatically for every single normal date LaFleur has checked. He looks every Monday for rates on Wednesdays and Saturdays over the coming two months or so. According to LaFleur, weekday asking prices are up 41 percent from when he started tracking them in November. Cosmo's rack rates are 88 percent higher than Aria and 118 percent higher than Vdara on on weekends in January. And, in other parts of the report, we learn that Aria has dropped rates for six of the dates checked through the end of February. Most notably, they lowered their Saturday night rate for MLK Weekend by $30 to $209, which is interesting because the another LaFleur chart shows that Bellagio is up $50 on the same night to $279. Cosmo's rates need to be taken cautiously because it is a new place and there's buzz. That second graph, in fact, shows that the rate differences between Cosmo and Bellagio/Aria/Vdara coming back into orbit by February. But I'm intrigued by this: Aria continues to be lowering room rates on the same holiday weekends that its big sister, Bellagio, is raising them, is not good news for the MGM Resorts bunch. P.S. It's worth noting that the weekend the Vdara folks tried to extort $50 out of my CityCenter-loving sister-in-law, the rates had been reduced twice in two weeks leading up to that date. So demand was empirically soft, but she couldn't even have a 1 p.m. checkout?!? Do you know if Cosmo opening more than 300 rooms or is demand for all 3,000 that great? Is there any word on how many units Cosmo has online right now? I only ask, as I'd have to believe that would play a factor in their current rates. I would have a hard time believing that for early winter dates with no players database to speak of (outside of the marriot rewards, which is a different beast), that they are anywhere near 2k rooms online, and once they do have all open, I can't imagine these prices are going to be anywhere near where they are now.